Are you stuck being old-fashioned? It could be the reason your business isn't as successful as it could be. We are in a new age and time, so as a retailer, it’s time to move on from doing things the “old-fashioned way” and switching on to the new way of running your business. Are you stuck being old-fashioned? It could be the reason your business isn't as successful as it could be. We are in a new age and time, so as a retailer, it’s time to move on from doing things the “old-fashioned way” and switching on to the new way of running your business. This is where a point of sale system software comes in. You definitely don’t want to be stuck in a world of using printed receipts, calculators or even late night inventory checks so it is important to upgrade your point of sale procedures. Adopting POS systems for your retail business or store is one of the most important steps you can take to develop and improve your business. A great POS system would ensure that your cashier or sales boy/girl won’t run into issues when the customers are ready to checkout. Inventory management: This is basically all about knowing how much products you have, how much you have moved and how much you need. 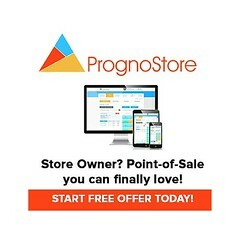 You need POS systems like PrognoStore to do most of the work for you. All you simply do is, scan the SKU of the products, enter the amount of products and the price up front and the POS does the rest. It helps you monitor your stock/inventory, notifies you on when you need to make new orders, tracks your biggest sellers; all these at the tip of your fingers! Keep track of customers: A good POS systems helps you keep track of your customers. Once a customer’s detail is saved on the system, you would be able to monitor that customers buying habits thereby stepping your customer service up a notch and being ahead of your competitors. Progressive reporting: This is can also be known as analytics. A good POS system lets you know how well a product is doing. It gives you report on the state of your business which is very essential for the success of your retail business. Obtaining information about your profits, expenses, prices, inventory and margins are all important and a good POS system would help you with this. Keep track of staff: POS systems can also track staff themselves; the times and hours worked and the number of transactions completed by a staff or sales person. This is not limited to one location only as it can be in the different outlets you have ensuring consistency across your stores in pricing, stock and accounts. Security: Your data is important. Data security is of critical priority. PrognoStore utilises 128-bit SSL encryption (comparable to most banks and financial institutions) to ensure that your sensitive data is safe and secure. The services should be hosted on highly scalable cloud computing platforms that integrate privacy and end-to-end security at hardware levels. You should be rest assured that your data is carefully protected. 24/7 support: As a retail business owner, you never really zone out. Your business is your first love and priority, so you’ll enjoy the benefits of cloud computing with a POS. Check customer analytics, sales numbers, inventory management, purchase orders and employee time cards from home on your iPad. Got a question about one of the features of your POS system that you didn’t have time to ask during business hours? No problem. With 24 hour support available seven days a week, somebody will be there to answer the question. Point of sale systems can make running your business easier than ever so it shouldn’t be overlooked. PrognoStore includes all these benefits to your business in our easy and simple to use software. It is a 3 in 1 cloud based solution that consists of Point of Sale, Inventory and Analytics; all that you need to run your store successfully. You should get started with using the best point of sale system in Nigeria. Simply sign up here www.prognostore.com/signup and start your risk free 2 weeks trial today!